Space Invaders used to be a simple game in its age, but now it’s widely seen as one of the games with the most influence ever. It helped expand the video game industry to a global industry. Why is this relevant? 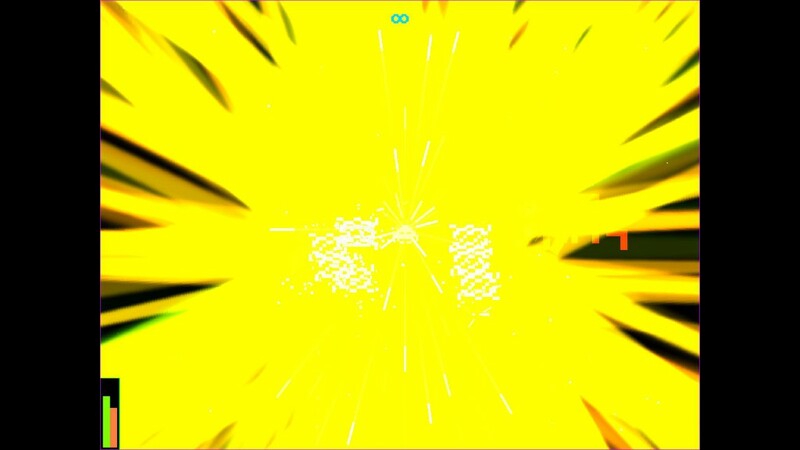 Well, because Space Invaders just took on a new form in VoidDev’s latest game: Void Invaders. Let’s see what they got in store for us. If you’re coming for story, Void Invaders is the wrong game for you. 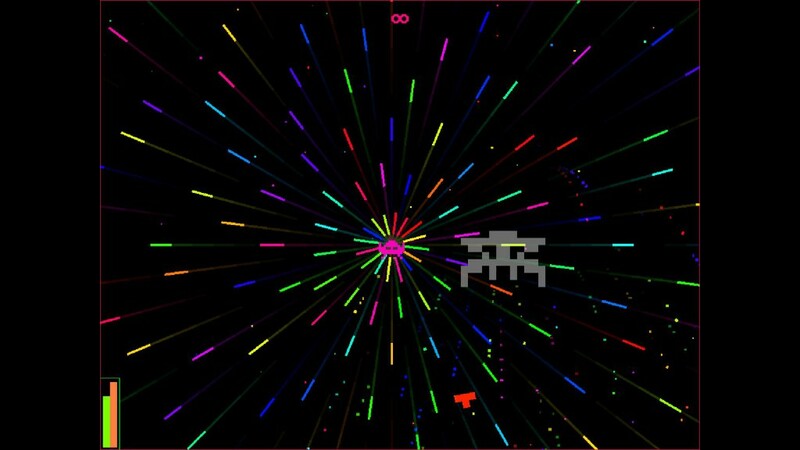 Much like all retro arcade games don’t have a story, Void Invaders doesn’t have one either! You simply get into the game and start shooting, simple as that, nothing attached. The graphics in Void Invaders have a very old-school look. All of the enemies look like sprites that came straight out of Space Invaders. They’re very blocky and give the game a really fun look. They also have very basic and solid colors, which makes it look really simple but it kind of fits with this game. Furthermore, the bullet animations also don’t look too fancy but yet again this contributes to the retro look and feel of the game. The only thing that looks really modern and over the top are the death animations. You’d think it’s nothing special, but every time you kill an enemy it explodes into a bright light. Once a lot of enemies fill your screen, the only thing you’ll see are flashes, which is really cool but take care if you’re epileptic. Also, don’t fret if you have a bad computer, because Void Invaders could probably run on a toaster if you tried. 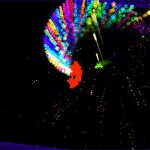 When it comes to sounds, Void Invaders is pretty much spot on. The music is awesome, filled with great beats and really contributes to the bullet hell you’ll find yourself in sometimes. Sound effects are very minimal but aren’t really that disturbing. It’s only a bit quiet once the song finishes and you only hear your shots. Also, while the music is awesome, it seems like there’s not a whole lot of it. You’ll find yourself listening to the same track over and over quite a few times. Gameplay wise, Void Invaders is a very simple game. It plays just like any Shoot em up: enemies come from the top of the screen and you’ll have to kill them in order to progress. The controls are also very basic, you have movement and shooting, that’s it. Void Invaders can also be played with a controller, which is always nice for games like these. First of all, just like any Shoot em up, your ship has a limited amount of HP. Once it’s depleted you’ll die and have to restart your level. To help you get through the harder levels, the game features a Ship Ranking. This is basically leveling up your ship, which can be done by simply killing enemies. Ranking up your ship gives extra HP, Attack, Defense and Rate of fire. So if you’re stuck on a level, it might be worth it to go back and level up a bit first. 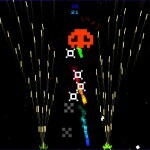 Void Invaders features a couple of game modes. You have Level Mode, Endless Mode and Boss Mode. They’re pretty straight forward but let’s go over them anyway. In Level Mode, you have twenty levels you can play through in order to beat that mode. Each level features other enemies and challenges for you to overcome. Every five levels you’ll also have to fight a boss, which can be really hard at times, but practice makes perfect. Once you’ve completed all twenty levels, you can start from level one again but on a difficulty higher. In total there are three difficulties: Normal, Hard and Nightmare. Then there’s Endless Mode which is, well, endless. You start with a fully upgraded ship and have to fight your way as far as possible. This might sound pretty easy but it’s far from it. Once you get around the 100.000 points mark, enemies will be filling your screen and you’ll be pretty much blinded by them dying, maybe you even have to use sunglasses if it starts getting too much. And oh, you only have one life as well. Last but not least: Boss Mode. This mode is unlocked once you finish the Level Mode on Nightmare difficulty. You simply kill all four bosses after one another without healing, once you die you start from scratch. Another very important thing in Void Invaders is power ups. Once in a while, you can find power ups falling from the top of the screen. This can give you a quadruple shot, triple shot, tornado shot, swaying shot and a couple more. These will be key if you want to finish the levels as smoothly as possible. When you’re feeling competitive, a while ago the Void Invaders developers have integrated the game with Steam, allowing for leaderboards in Endless Mode, Steam achievements and trading cards. 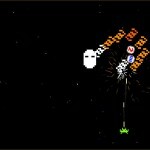 Void Invaders tried to pay a homage to the classic Space Invaders and it very much succeeded. The game is fast paced, has a fair amount of content and has great music (even though there isn’t a lot of it). Knock yourself out in trying to beat Level Mode or Boss Mode or go straight for Endless Mode and get to the top of those leaderboards!